You can see exactly how recently you’ve been active in each of your Tribes to ensure you are sharing the freshest content and following your Tribe's rules. 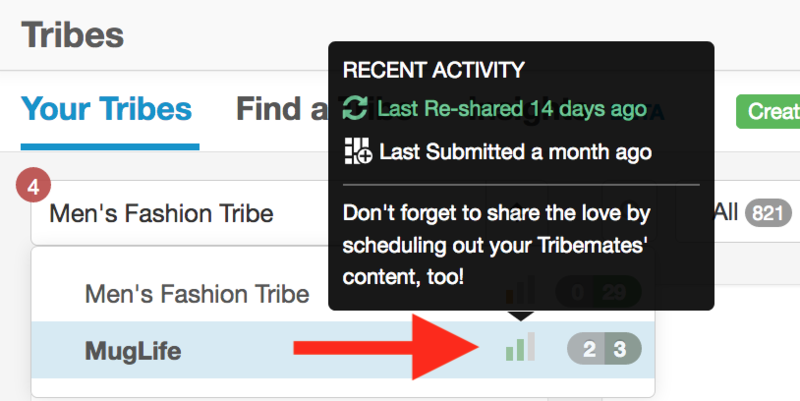 Gauge at a glance which Tribes have content for you to share by noting where your Recent Activity Indicator is getting low, then quickly fill your schedule with awesome content from your talented Tribemates to refill your Activity Rating. The Activity Indicator in the Tribes drop-down menu will let you quickly see your activity levels for all of the Tribes you are currently in. This is a great way to see how you have been keeping up with your Tribes and if there are any Tribes you might want to give more attention to. You can see your recent activity in each Tribe in your Tribes dropdown menu. Hover over the activity indicator to the right of each Tribe name for recommendations on what to do next to keep you actively engaging with all of your Tribes while sharing the freshest content! You can also see this activity rating to the right of your Tribes Username in the Tribe Members list.